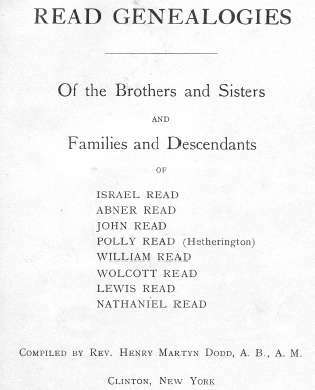 The book, "Read Genealogies, Of the Brothers and Sisters and Families and Descendants of Israel Read, Abner Read, John Read, Polly Read (Heatherington), William Read, Wolcott Read, Lewis Read and Nathaniel Read," compiled by Rev. Henry Martyn Dodd, privately printed in Clinton, New York, 1912. 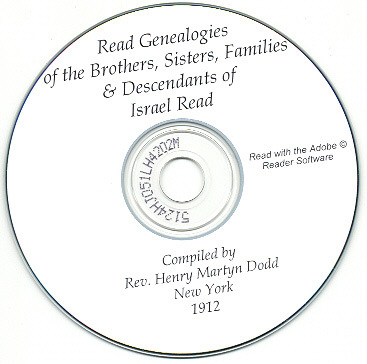 In addition to the book itself you get an original copy of the September 1914 Supplement (#1) to the book issued by the author, a transcription of the Bible records of the Isaac Hetherington & Polly Reed family, and a number of obituaries gathered by a previous owner for folks listed in the book. In addition, previous owners have made a number of handwritten notes in the margins of some pages to either correct errors or add additional information about the folks in the book. Please note: This is not a paper book, it is a scan of the original paper book into the digital Adobe PDF format, written on a CD-ROM. You read this book on your computer using the free Adobe Reader software. It is a digital version of a hard to find book. If you could find a copy of the 1912 printed book, it would be very expensive. Aaron Read, Abner Read, Ada Read, Ada Mabel Read, Addie Read, Adena Belle Read, Adelbert Albertson Read, Adrian Jasper Read, Agnes Catherine Read, Albert Elijah Read, Albert Maxwell Read, Aleitza Ruth Read, Alfred Read, Alice Mary Read, Alice Theresa Read, Alice Amelia Read, Allie May Read, Alma Ann Read, Alta Mabel Read, Alvo Read, Amanda Melissa Read, Andrew Read, Angeline Read, Ann Read, Anna Read, Anna Eliza Read, Anne Emily Read, Annette Hannah Read, Anson Read, Arlie Albertus Read, Athalanta Read, Benjamin Read, Benjamin Giles Read, Bertie Read, Betsey Read, Betsey Read, Betsey Ann Read, Brayton Read, Carl Adelbert Read, Carlos Duane Read, Carrie A. Read, Carrie Hinckley Read, Candes Adeline Read, Caroline H. Read, Catherine Read, Catherine B. Read, Catherine McKay Read, Catherine Elizabeth Read, Charles Read, Charles Albert Read, Charles Brayton Read, Charles Francis Read, Charles H. Read, Charles Harvey Read, Charles Herbert Read, Charles May Read, Charles Warren Read, Charlotte Read, Clara Augusta Read, Clara May Read, Clarence Adrian Read, Clark Read, Clarion Adelbert Read, Clifford Lynn Read, Clifford William Read, Clinton Eugene Read, Cora Read, Cordelia Elitha Read, Cora Grace Read, Cora Lillie Read, Curtis Read, Cynthia Read, Cyrus Sandford Read, David Allen Read, Delia Elizabeth Read, Deliverance Read, Dora Alvina Read, Dora M. Read, Dora Maria Read, Dorothy Read, Eaton D. Read, Earl M. Read, Ecco Delta Read, Edgar Read, Edgar W. Read, Edith Adelia Read, Edith Julia Read, Edward James Read, Edward Read, Elgene Wolcott Read, Elijah Martin Read, Elitha Read, Eliza Read, Eliza A. Read, Eliza Diana Read, Eliza Jane Read, Eliza Katherine Read, Elizabeth Read, Ella Bertha Read, Ellen Adele Read, Elloise Read, Elmer Eugene Read, Eisle Read, Eisle May Read, Emma Read, Emma Jane Read, Emeline Read, Esther Read, Esther L. Read, Ervin Read, Ervin Clifton Read, Ernest Eugene Read, Ethel Helene Read, Ethland Read, Etta Read, Eugene Read, Evaline Read, Eva Rosina Read, Eventus Fletcher Read, F. A. Read, Fanny Read, Fanny Helen Read, Flora Estelle Read, Florence Read, Florence Charlotte Read, Florence Dorothy Read, Florence Matilda Read, Floyd Denison Read, Forest H. Read, Foster Devillo Read, Frank Read, Frances Read, Franklin Read, Francis Adelbert Read, Frances Eliza Read, Frances Josephine Read, Francis Read, Francis A. Read, Francis E. Read, Francis Eugene Read, Francis James Read, Francis Theodore Read, Francis Xavier Read, Fred Sheldon, Garrett Read, George Compton Read, George Read, George Agnew Read, George Houston Read, George Arba Read, George Albert Read, George Cady Read, George Herbert Read, George Nathaniel Read, Gertie Read, Gertrude Anna Read, Gilbert Read, Gorden Read, Gladys Irene Read, Gorton Nelson Read, Grace Read, Guy Read, Hannah Read, Harriet Read, Harriet Elizabeth Read, Harriet J. Read, Harriet Janet Read, Marriet Marie Read, Harriet Mildred Read, Harry James Read, Harry Samuel Read, Hattie M. Read, Helen Red, Helen Adeline Read, Helen Eugenia Read, Helen Lavina Read, Helen N. Read, Henry Read, Herbert Clifton Read, Herbert Elgene Read, Herbert Leo Read, Herbert Mckinley Read, Herbert Roselle Read, Hiram Read, Homer Read, Howard Read, Howard Clark Read, Howard Payne Read, Howard Phelps Read, Hubbard Read, Ichabod Read, Ida Read, Ilo Gayle Read, Ina May Read, Irvin Read, Isaac Read, Isaac Hetherington Read, Isabel Read, Isadora Read, Israel Read, Iva Read, Ivo Earnest Read, James Read, James Augustus Read, James Smith Read, Jane Amelia Read, Jane Elizabeth Read, John Ludovicus Read, Jennie May Read, Jeremiah Read, Jesse Read, John Read, John Blue Read, John Meredith Read, Jonathan Read, Joseph Read, Joseph Addison Read, Joseph Clark Read, Joseph Edward Read, Julia Ann Read, Julia Elitha Read, Juliet Margaret Read, Katherine Read, Katheryn Read, Laura Ann Read, Laura Maria Read, Lawrence Read, LeRoy Read, Lewis Read, Lewis Edwin Read, Lewis Erastus Read, Lewis Eugene Read, Lewis Floyd Read, Lida Read, Logan Read, Lois Ann Read, Lois Irene Read, Lonson Patchen Read, Louisa Read, Lovisa Read, Lovina Read, Lucena Barbour Read, Lucretia Jane Read, Lucy Esther Read, Lura Elma Read, Lura Elsie Read, Luther James Read, Lydia Ella Read, Malintha Read, Maranda Read, Mabel Read, Mabel Ida Read, Mamie Read, Margaret Read, Margaret Ellen Read, Marie Josephine Read, Maria Wiser, Martin Stryker Read, Martha Read, Martha Maria Read, Martha Gertrude Read, Marvel Gladys Read, Mary Read, Mary Addie Read, Mary Ann Read, Mary Catherine Read, Mary Delight Read, Mary Eleanor Read, Mary Esther Read, Mary Evelyn Read, Mary Jane Read, Mary Josephine Read, Mary Narcissa Read, Mary Rocelia Read, Maude Jane Read, Maynard Lloyd Read, Mercy Read, Milissa Finette Read, Monnista Dorothy Read, Myrtle Read, Myra Mabel Read, Nancy Read, Nancy Lucinda Read, Nancy Maria Read, Nathan Read, Nathaniel Read, Nathaniel Record Read, Nettie Read, Nettie Coy Read, Nola Alberta Read, Noyes Lambert Read, Olive Roxana Read, Opie Percival Read, Orpah Iriss Read, Orra Read, Orville Read, Orville Orsine Read, Owen Perry Read, Pamelia An Read, Peter Read, Phebe Elizabeth Read, Philander Read, Philip Gordon Read, Phillis Elizabeth Read, Polly Read, Priscilla Read, Ralph Read, Rayburn Robert Read, Record Read, Reckford Read, Richard Read, Riley Read, Robert Read, Robert Threshire Read, Robert Gillespie Read, Robert Archibald Read, Rose Mary Read, Rose Melvin Read, Rosetta Minerva Read, Roxcena Read, Ruth Read, Ruth Georgine Read, Ruth Hazel Read, Ruth Marcella Read, Sally Read, Sally Ann Read, Samuel Read, Samuel Chasler Read, Sarah Read, Sarah Angeline Read, Sarah Frances Read, Sarah Maranda Read, Sarah Rebecca Read, Sardis Alviro Read, Seth Read, Sena Read, Simeon Read, Spencer De Witt Read, Stanton Eaton Read, Susan Read, Susanna Read, Thankful Read, Thelma Theresa Read, Thomas Read, Thomas Brackett Read, Thomas Buchanan Read, Thomas Mayne Read, Thomas Wemysis Read, Ula Fay Read, Verna Read, Vernie Read, Veronica Roosevelt Read, Virginia Read, Walter Read, Walter Ervin Read, Warren Read, Wayne Abner Read, Webster Read, Welby Read, Wesley Sylvester Read, Whitelaw Read, William Weymouth Read, William Woburn Read, William Read, William Barnard Read, William Bradford Read, William Cruickshank Read, William Edward Read, William Elmer Read, William Edgar Read, William Ervin Read, William Henry Read, William Patrick Read, William Record Read, William Whitehouse Read, & Wolcott Read. Charles Hughes, Frederick S. Hughes, Helen Jeannette Hughes, John Frederick Hughes, Dorothy Jane Hughes, Cemetery Humphrey, David Hunt, Abraham Hunt, Chase Perkins Hunt, Angeline Hunter, C.P. Huntington, "Dean" Hurd, Charles C. Hutchinson, Harlow Hutchinson, Harlow Eugene Hutchinson, Eugene S. Hutchinson, Melvin Noyes Hutchinson, Alma Amelia Hutchinson, Abby Adelia Hutchinson, Charles Clarence Hutchinson, James Arthur Hutchinson, Ethel Rosella Hutchinson, Raymond C. Hutchinson, William Smith Hutchinson, Ralph Thomas Hutchinson, Charles Arthur Hutchinson, Oscar H. Huyck, Charles Huyck, Seymour Huyck, Bessie Huyck, Howard Huyck, Henry Huyck, Nellie Huyck, Ingersol, Bertha Mansfield Ireland, James Ives, Mary Ann Jacobs, Benjamin Jacobs, Stella Lillian Jackson, Hiram Jackson, Eleanor Ann Jackman, Henry W. Jewett M.D., Nellie Jewett, Eliza Jhondrow, Isaiah Johnston, Rev. Herrick Johnson D.D., George W. Johnson, Gernon Huber Johnson, Dean Elsworth Johnson, Anna Johnson, Cora B. Johnson, James A. Johnson, Charles Johnson, Bernice Marie Johnson, Floyd Johnson, Glenn E. Johnson, Bertha M. Johnson, Hazel A. Johnson, Aletta Alice Johnson, Hans Johnson, Virgil Johnson, Margaret Johnson, Eva Johnson, Joseph H. Johnson, Joseph Read Johnson, Anna Icedora Jones, Aaron Jones, Emma Viola Jones, Ida K. Jones, Arthur Jones, Robert Jones, Arthur Williams Jones, John Jones, Nelson Jones, Vera Jones, Roy Jones, Irene Jones, Ralph Jones, Ruth Jones, Mark Joplin, Wayne Jordan, Benoni Jordan, Ancil Elmer Jordan, Martin Elsworth Jordan, Charles Franklin Jordan, Thella May Jordan, Carrie H. Jordan, Emma Julia Jordan, Ivy Pearl Jordan, Bessie Elma Jordan, Paul Devon Jordan, Ruby May Jordan, Dale Forest Jordan, Josephine B. Jordan, Eugene Bonaparte Jordan, Maria Joyner, Ethel May Judd, Maxie Judson, Hayward Judson, William Kane, Cora E. Kane, Pearl E. Kao, Ella Belle Kao, William Nelson Kao, John Keller, John Ellsworth Keller, Albert J. Keller, Dora Belle Keller, Mary Etta Keller, Clarence Elmer Keller, Clara Elma Keller, Nora Katherine Keller, Lucy Jane Keller, Florence Harriet Keller, Elizabeth Keller, Orelle Keller, Hannah Kellogg, Joseph Kent, Justus Vinton Kent, Ezekiel Kent, Earl Owen Kent, Newton Eugene Kent, Charles Burton Kent, Justus Willis Kent, Anna Louise Kent, George Willis Kent, Franklin Vinton Kent, William Henry Kent, Justus Eugene Kent, Frank Burton Kent, Harry James Kent, Phena Irene Kent, Louise May Kent, Lulu May Kent, Charles Newton Kent, Nellie Louise Kent, John Owen Kent, Edith May Kent, Clinton Jay Kent, Burton Ray Kent, Howard Carpenter Kent, Marilla Irene Kent, Justus Vinton Kent, Ruth Margaret Kent, Mary Louise Kent, Bessie Thelma Kent, James William Kent, Kenneth Kent, Peter King, Thomas Kingsbury, Arthur O. Kingsbury, Fanny M. Kingsbury, Alice A. Kingsbury, Stanley E. Kingsbury, Charles Kinney, Mary E. Kinney, Susan Kelly, Minnie Kizer, Clyde Kizer, Anne Klinger, David Klinger, James G. Klock, Peter G. Klock, Ann Elizabeth Klock, James Eugene Klock, Mary I. Klock, Georgiana Klock, Mary Selina Klock, George Glenn Klock, Ida May Klock, Helen Irene Klock, James Eugene Klock, Dorothy Dean Klock, James Harold Klock, Louema Klock, Nelson Klumph, Jason Knapp, Charles R. Knapp, Emily Knapp, John Knapp, Harriet Louise Knapp, Christiana Kritzer, Alpheus Kyes, Lydia Lacy, William Lacy, General LaFayette, John E. Lambkin, Guy E. Lambkin, Sanders Lansing, Patroon Cornelius Lansing, Rev. 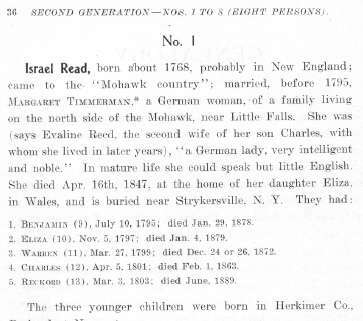 Dirck Lansing, D.D., Abraham Lapham, Hiram S. Lapham, Hannah S. Lapham, Amelia Lange, Ella M. Lander, John N. Larsh, Napoleon Bonaparte Larsh, N. B. Larsh, Anna Laura Latimer, Walter S. Latimer, George S. Latimer, Dorothy Jane Latimer, Joseph Lawrence, Mabel Lawrence, Alvidos Lawrence, Eugene Lawson, Hedve Katherine Ledholm, Henry Lee, Harvey Lee, Marian Eleanor Lee, Clifford Raymond Lee, Mildred Jessie Lee, Harry Henry Lee, Florence Lewis, Elizabeth Jane Lint, Thomas John Little, John Thomas Little, Harriet Little, Herbert Eugene Little, Joshua Little, Sarah Emma Little, Justus Aller Little, George Forest Little, Catherine Little, "Manors" Livingston, Pater Van Brugh Livingston, William T. Livingston, Dorothy Jeanne Livingston, Catherine Livingston, Sarah A. Logan, Lorenzo Lonsby, Charles Lonsby, Lovina Jane Loomis, George Loosemore, Henry Stead Loosemore, "Brothers" Lonyo, Angeline Lonyo, Betsey Lonyo, Andrew Warren Lonyo, Lucy Lonyo, Albert Lonyo, Orissa Lonyo, Louis Lonyo, Julia Lonyo, Arnold Willard Lonyo, Emma May Lonyo, Daisy Editha Lonyo, Julia Maud Lonyo, Orville William Lonyo, Andrew Warren Lonyo, Hiram Arnold Lonyo, Jessie Lonyo, Edith Julia Lonyo, Martha Angeline Lonyo, Mary Ann Lonyo, Albert Raymond Lonyo, Charlotte Elizabeth Lonyo, Louis Charles Lonyo, Julia Angeline Lonyo, Lillian Isabel Lonyo, Jennette Orissa Lonyo, Alice Louise Lonyo, Louis George Lonyo, Willard Lonyo, Thomas Lord M.D., Samuel Lord, William Lord, Samuel Lord Jr., Etta Lucena Lord, Minnie Viola Lord, Reverdy Reed Lord, Gladys M. Lord, Kate Ludwig, John Ludwig, John S. Luther, Samuel Luther, Caleb Luther, Jabez Luther, Mary Ann Luther, Marie E. Luther, Ellen M. Luther, Elsie Louise Mabie, Harry Macklin, Arlena Macklin, Reola M. Macklin, Mary Blanch Macklin, Mabel I. Macklin, Benjamin Franklin Macklin, Rev. Asa Mahan D.D., Alexander Mains, John Mains, Esther Mains, Eliza Mains, Polly Maria Mains, Alvira Mains, Caroline Mains, Major Family, John Major, John Maxwell Major, Isaac Newton Major, Mary Jane Major, Arabella Major, Caroline Brayton Major, William Henry Major, Carol Belle Major, Henry Hubert Major, Nellie Lou Major, Thomas C. Major, Abel Mann, John Joseph Marrinan, James William Marrinan, Christian Martin, William Martin, Clarence Martin, Victor Martin, Clifford Martin, Catherine Elizabeth Marsh, Ezra March, Leon L. Marvin, Andrew Mason, "Anna" Mason, Allen Mason, Andrew Brooks Mason, Alzade Mason, Alta Lorette Mason, Alice Irene Mason, Atwood Samuel Mason, Amy G. Mason, Adelbert Lea Mason, Alice May Mason, Arthur James Mason, Brooks Mason, Bernice Lucille Mason, Candis Mason, Charles William Mason, Cecil Dwight Mason, Carrie Alice Mason, Charles Irvin Mason, Caroline Belle Mason, Charles E. Mason, Carl Waldon Mason, Charlotte Henrietta Mason, Caroline Alice Mason, Clyde Stevenson Mason, Clarence Maynard Mason, Cora Agnes Mason, Clara May Mason, Clark W. Mason, Clara E. Mason, Dora Rosella Mason, Eddy Mason, Eaton Mason, Evelyn Louise Mason, Emma Jane Mason, Ellsworth Theron Mason, Ellis Everett Mason, Eunice Evelyn Mason, Eunice C. Mason, Ethel May Mason, Eleanor Mason, Edwin Ezra Mason, Everett Lowell Mason, Evelyn Mason, Frank Riley Mason, Flora Mason, Frank Howard Mason, Florence Opal Mason, Floyd R. Mason, Fred S. Mason, Franklin Mason, Garner Mason, George Chauncey Mason, Gardner Mason, George Franklin Mason, Genevieve Mason, Geneva Evelyn Mason, Hayden Kneeland Mason, Herbert Lincoln Mason, Herbert Edwin Mason, Howard Lowell Mason, Harry B. Mason, Hattie Corinne Mason, Helen Louise Mason, Hazel Marie Mason, Harold Henry Mason, Israel Reed Mason, Ida Mae Mason, Ivan T. Mason, "Capt. " John Mason, "Jolly" Mason, Jarvis Mason, John Garner Mason, Judson Warren Mason, Julia Maria Mason, John H. Mason, James Clark Mason, Jasper Wosten Mason, Judson Harold Mason, John Mason, Lydia Eleanor Mason, Laura Edna Mason, Lyman Clark Mason, Louis Frederick Mason, Lawrence Judson Mason, Leslie Raymond Mason, Lucina Edna Mason, Lelia Arminta Mason, Leonard Roy Mason, Lea William Mason, M.C. Mason, Michael Mason, Malaca (Malachi) Mason, Martin Mason, Margaret C. Mason, Merrills Lovell Mason, Rev. Marcus Clark Mason, Mercy Adelle Mason, Mary Elizabeth Mason, Milton Stanley Mason, Margaret Mason, Mabel Julia Mason, Margaret Elizabeth Mason, Nabby Mason, Olive Orelle Mason, Orrie Mary Mason, Paul Mason, "Roda" Mason, Riley Eaton Mason, Rosa B. Mason, Ralph Waldo Mason, Roger Eaton Mason, Russell Howard Mason, Ruth Mason, Susan Mason, Salley Mason, Sybel Mason, Sally Ann Mason, Seth Martin Mason, Sophia May Mason, Stella Helen Mason, Vesta Amanda Mason, Walton Mason, William Byron Mason, William O. Mason, Willis Raymond Mason, Rev. Wallace Norman Mason, Walter F. Mason, Rev. Walter Clark Mason, Wayne Robert Mason, George R. Masters, William Masters, Maude E. Masters, Mary G. Masters, Clara Masters, Sindome Mattice, Caroline Matthews, Thomas J. Matthews, Stella Jane Matthews, William Matthews, Bertha E. Mattley, Herbert Mattley, Rev. Richard Mather, Timothy Mather, Atherton Mather, Rev. Samuel Mather, Rev. Nathaniel Mather, Rev. Cotton Mather, Rev. Increase Mather, Enos Mather, Maria Mather, Tamar Mather, Lovisa Mather, Dan Mather, George Mather, Edna Mather, David Mather, George Franklin Mather, David Hugh Mather, Ada Maria Mather, Myra Mather, Flora Louisa Mather, William Houghton Mather, Merton Everett Mather, Robert Earl Mather, Doris Harriet Mather, Florence Mather, Marlyn Mather, Everett M. Mather, James H. Maucker, Russell J. Maucker, Lydia M. Maucker, Lena Adam Maucker, Mary Elizabeth Maucker, Otto Maucker, Margarett Frances Maucker, Jane Mayes, Olin S. McArthur, John W. McArthur, Eliza R. McArthur, Viola McArthur, Grace E. McArthur, Robert E. McArthur, Mary McCall, McClelland, William Taylor McCartney, William G. McCartney, Lena Grace McCartney, Mary Lovisa McCartney, Scott Reed McCartney, Lottie Edith McCartney, Lulu May McCartney, William Taylor McCartney, Thomas Edwin McCartney, Rebecca McCallum, Edward Henry McCallum, John McCumber, John C. McCray, Isaiah McCray, Isabel McDonald, Sarah McGann, Mrs. Elizabeth McGee, Sarah Mina McGee, Catherine McGuire, Wilbur T. McElhinney, Thomas McElhinney, Albert McElhinney, Earl McElhinney, Charlotte Elizabeth McIntosh, Harriet N. McIntosh, Daniel McKay, John McKenna, Sarah Bell McMichael, Christina McVean, Immanuel Mendell, William Edward Mendell, Ida Lillian Mendell, Alpha Etta Mendell, Alice Eva Mendell, Connie Mendell, Gaynell Mendell, Maria Merriman, Benjamin Merriman, Aaron Newton Merrill, Addie May Merrill, Alden Moss Merrill, Benjamin Addison Merrill, Blanche Lucinda Merrill, Charles Merrill, Cecil Clifton Merrill, Cora Alice Merrill, Dennis Mahlon Merrill, Ernest Clifton Merrill, Edward Merrill, Edgar Benjamin Merrill, Ernest Pierce Merill, Florence Ellen Merrill, Fred Merrill, Grandison Moss Merrill, George Merrill, Gladys Ivy Merrill, Ida Jane Merrill, James Nathaniel Merrill, Jessie Lucinda Merrill, John E. Merrill, James Merrill, Kate Bell Merrill, Lucy Maria Merrill, Loren Merrill, Lucy Sarah Merrill, Laura Mead Merrill, Ledlah Merrill, Lebon N. Merrill, Lucy Liza Merrill, Mahlon Grandison Merrill, Mary Merrill, Mary Elizabeth Merrill, Nettie Orcelia Merrill, Orvil Newton Merrill, Ruth Lucy Merrill, Ruby Irene Merrill, Sarah Jane Merrill, Sarah Pauline Merrill, Viola Merrill, William Henry Merrill, Warren Merrill, Helen Sophia Merry, Gottleib Merry, John Franklin Messinger, Nettie Louise Messinger, Jesse E. Mick, Ada Mick, May Emma Mick, Spencer Eugene Mick, Jesse Lewis Mick, Eddy Clay Mick, Josephine Amy Mick, Alzina Edith Mick, Clara Adelia Mick, Ethel Louisa Mick, Winifred Mick, Madora Mick, Charlotte Miles, Sarah Millington, Sabrina Millard, Hazel M. Mills, Henry Lee Mills, Maxime C. Mills, Mr. Minot, Gertrude Moon, Edward Mitchell, William John Mitchell, Henry Herbert Mitchell, Julia Alice Mitchell, Lydia Moore, William R. Monroe, Harriet Bell Monroe, Samuel Moler, William Clayton Moler, Elizabeth Moler, Albert T. Mosher, John Moyer, Val Momma, Nicholas Momma, Mary Grant Momma, Lulu Mudge, Glaphyra Mullins, Anne Musson, Ida Myers, Andrew Myers, Michael Myers, John Nason, Sylvia Nason, Narcissa Lee Nason, Alice Neidig, John Neidig, Isaac Nellis, Paul "Ball" Nelson, Malvina Nelson, Nora Cecil Netzley, E.C. Nice, Leonard May Nice, Emma Amelia Nice, Herbert William Nichols, Charles Luther Nichols, Nora Luella Nichols, Dallas Henry Nichols, George Henry Nichols, Ettie E. Nichols, Mertie V. Nichols, Mabel L. Nichols, Emma E. Nichols, Albert Clinton Nicholson, Sophia Catherine Nihoff, John Nihoff, Thomas P. Nightingale, Edgar Little Nightingale, Thomas Leslie Nightingale, Francis Byron Nightingale, Richard Nightingale, James Nightingale, Gertrude Marian Nightingale, Harriet Elizabeth Nightingale, Walter K. Norris, John Northrup, William Denison Olmsted, Rev. Edwin B. Olmsted, Richard Rollin Olmsted, Dorothy Elsie Olmsted, Merton Olmsted, Hester Orwig, John Owen, Louise Owen, A.B.C. Pace, Philea Palmer, Charles Palmer, Antha Pardee, Delphine Parker, Williard Parker, Charles Parker, Ina May Parker, Ansel Parker, George Fred Parker, Elizabeth Parkman, Mr. And Mrs. Parmalee, Florence Parry-Thomas, Joseph A. Parsons, Susan Parsons, Joseph Parsons, Henry Logan Parsons, Howard H. Parsons, Leroy Edward Parsons, Ernest Burt Parsons, Howard Parsons, Polly Patchen, William Patterson, Rosetta Patterson, Norman A. Patterson, Partridge, David Patton, Charlotte Patton, Ida M. Paul, Chris Paul, Philip Payne, John Payne, Martin Payne, Hiram Payne, Stephen Payne, Mary Payne, Esther Payne, Frank Payne, Fred Payne, Lovisa Payne, Seth Payne, Daniel Payne, Fred Elton Payne, Camilla Ora Payne, Elva Payne, Elizabeth Payne, A.J. Payne, Bertha Eldra Payne, Sally Fenner Pearce, Elizabeth Pearce, Sophronia Pecher, Andrew Pecher, Mrs. Peebles, John Petersen Peek, Mary Cornelia Peek, John Benjamin Peek, Frances Peek, Delbert F. Peek, Jane Percival, Sarah Perkins, Susan Perry, Comodore Perry, Louis Perry, Jay Ellsworth Perry, Carl Perry, Margaret Matilda Perry, Carl Perry, Margaret Matilda Perry, Martha Perry, Russell Perry, Jessie Euretta Pettigrew, Helen Margaret Pettigrew, Adeline Petrie, John M. Petrie, Mark Petry, "Jake" Petrie, Lydia E. Pfrimmer, Elen Phendler, Mrs. Phelps, Gouveneur Phelps, Hattie Phelps, Catherine Phillips, Peter Pickard, Isaac Pickard, Nicholas Pickard, Bartholomew Pickard, John Pickard, Joseph Pickard, Adolph Pickard, Conrad Pickard, George Pickard, Nicholas I. Pickard, Eldert Pickard, Grace Pickard, Robert Pickard, Christian Pickard, Catherine Pickard, Ann Pickard, William Pickard, James Pickard, Mary Pickard, Thomas Pickard, Morgan Pickard, Gertrude Pickard, Moses Pickard, Rebecca Pickard, Elizabeth Pickard, Eliza Pierce, Priscilla Pinsonneault, Alice Plant, Miles Plumb, John Poellet, Erhardt Poellet, Barbara Margurette Poellet, Edgar Adelbert Poellet, Lawrence Erhart Poellet, Mary Polmear, Josephine Poorly, Mary Poorly, Emily Popple, Joseph Porter, Jane Porter, James Post, Luther J. Post, Emma J. Post, Eliza May Post, Eventus Austin Post, Israel Post, Edmund J. Post, Glenna V. Post, James Sidney Post, Edmond J. Post, George Raymond Post, Russell Austin Post, Lester Leroy Post, Edna Reed Post, Ann Potts, James Henry Potter, Zebina Potter, Elizabeth Potter, James Reed Potter, Warren Zebina Potter, James Brunner Potter, Frank Cooper Potter, Seth E. Powers, Charles Powers, George Powers, Josephine Powers, Ada Powers, Steven Ellis Pratz, Elizabeth Fay Prentice, Sally Ann Preston, Agnes C. Price, Amanda Price, Carrie Prindle, John Prindle, "Col." Putnam, Nettie Purcell, Lizzie P. Rathjens, Polly J. Raymond, Margaret Elizabeth Reagan, Uncle Reckord, Allis Reckord, Samuel Reckord, Jacob Reckord, Israel Reckord, Abner Reckord, William Reckord, Andrew Reckord, William Reckord, Andrew Reckord, Chloe Reckord, Mary Reckord, Deborah Reckord, Hannah Reckord, Voadicea Reckord, Weston Reckord, Marcia Reckord, Alden Reckord, Gerry Kendrick Reckord, John Reckord, Henry Reckord, Peter Reckord, Conradt Reckord, "Tex" Reckord, Jacob Rickhardts, John Rickhardts, Frederick Rickhardts, George Rickhardts, Ludwig Rickhardts, Anna Rickhardts, Catherine Rickhardts, Elizabeth Rickhardts, Maria Rickhardts, Delia Rickhardts, William Redman, George Reinhart, Harriet Reinhart, Theresa Reuter, George H. Reynolds, Ella J. Reynolds, David Elmer Rice, Lela May Rice, Iris Ida Rice, William Allen Rice, Richard Richards, Ann Richards, Margaret Richards, Harriet Norris Richards, William Richards, Roxcey Celinda Richardson, Charles Richardson, Henry George Richardson, Amanda Richardson, Mary Richardson, Susannah Richmond, Cora Caroline Ring, Emma Ring, Barnard C. Ring, Nathan Rix, George Rix, Alice Rix, Frances Rix, Royal Robbins, Margaret Louise Roberts, John Roberts, William Robinnette, David P. Robie, Hiram Robie, Samantha Rogers, Hannah Rogers, Elisha Root, Jane Rose, John Rose, Sarah Rose, Charles L. Rowan, Minnie Viola Rowan, Norman Rowan, Mary Rowan, Thomas Rowley, Sophronia Rudd, Samuel Grove Rutter, Herbert Joy Rutter, Allen E. Rutter, Delbert E. Rutter, Samuel Giles Rutter, Harriet Mabel Rutter, Ray Moore Rutter, Irene Rutter, Phebe Russ, John Russell, Margaret Ryan. Ruby Sage, Emeline Sacket, Edward Salisbury, Lucy Salisbury, Eliza Salisbury, Abby Sales, James Sample, John Sample, William John Sample, James Latta Sample, George Washington Sample, Joseph Sample, Charles Walker Sample, Mary Louisa Sample, Phebe Adelaide Sample, Catherine Sample, Emma Gertrude Sample, Clarence Walker Sample, Jessie Latta Sample, Helen Carleton Sample, John Sampson, Oran D. Sampson, Lloyd Ellis Sampson, Kenneth J. Sampson, Glennon Sampson, Elizabeth Sanborn, Maria Sandefur, Elizabeth M. Sandefur, Nancy Savage, Adeline Schermerhorn, Addie Eugenia Schermerhorn, Baldwin Schermerhorn, Bersha Schermerhorn, Bertha Schermerhorn, Cornelius Schermerhorn, Caroline Schermerhorn, Clyde D. Schermerhorn, Evert Lansing Schermerhorn, Florence Hartness Schermerhorn, Hayden Schermerhorn, Hazel Oneita Schermerhorn, Helen Esther Schermerhorn, Jacob James Schermerhorn, Jacob I. Schermerhorn, Jacob H. Schermerhorn, John Maxwell Schermerhorn, John Cornelius Schermerhorn, John C. Schermerhorn, Jesse Maxwell Schermerhorn, Levi Chase Schermerhorn, Lydia Ann Schermerhorn, Lydia Annette Schermerhorn, Merril Major Schermerhorn, Mary Jane Schermerhorn, Nancy Mabel Schermerhorn, "Ryer" (Uriah) Schermerhorn, Scott Schermerhorn, William Groesbeck Schermerhorn, William L. Schermerhorn, Bertha Schumacher, Owen G. Scofield, David Schreiter, Jane Caroline Schreiter, Sir Walter Scott, Susan Scott, Robert Scott, Grace Scott, Thomas G. Scott, Thomas J. Scott, Syd R. Scott, Searles, May M. Seavey, Jerome L. Seavey, Ada Severson, Ole Severson, Herman R. Sergel, Leonard Sergel, Mildred Sergel, Brayton Read Sergel, George Seifred, Biddy Josephine Sexton, William P. Sexton, Robert Seyse, Walter S. Seymour, Charles Seymour, Charles Bronson Seymour, Bernice Harriet Seymour, Everett Kyes Seymour, Theresa Shalop, Polly Shaw, Sarah Jane Shaw, Romanzoff A. Shaw, Sarah Florinda Sheldon, Benjamin Barber Sheldon, Laura M. Shepard, Eunice Shepard, Minnie Sheridan, Emma Sherwin, James M. Sherwin, William Shipman, Matie Estella Shipman, Delos W. Shipman, Albert Clinton Shimmel, David Shimmel, Alta Azora Shimmel, Earl Clinton Shimmel, Ethel Blanche Shimmel, Mabel Violette Shimmel, Lester Albert Shimmel, Matilda Shirly, Lovina Shoemaker, Harriet Shoemaker, Charles E. Shoemaker, Alpha Shoestall, Joseph Shoestall, Mabel Shoestall, Hazel Shoestall, Evaline Simmons, Anthony Simmons, John Simmons, Lucile Marie Simmons, Josephine Simmons, Mary E. Simpson, Caroline Skinner, Edward Skinner, Beverly C. Skinner, Ada Finnette Smith, Alden Grover Smith, Asa Plimpton Smith, Amy Smith, Ansel B. Smith, Benjamin Franklin Smith, Charles Wesley Smith, Elijah Smith, Edith Eliza Smith, Ella Florence Smith, Elizabeth Smith, Elgene Arthur Smith, Edso Dorr Smith, Eugene Frederick Smith, Eunice Agnes Smith, Flora LaVerne Smith, Florence Nightingale Smith, Gerritt (Hon.) Smith, George Smith, Georgine Smith, Glenna Rockford Smith, Henry Smith, Hester Read Smith, Homer Verne Smith, Harry S. Smith, Jacob Smith, John Smith, James P. Smith, James Leslie Smith, Joseph Smith, Leonard Clifton Smith, Lydia Plimpton Smith, Mary Smith, Matilda Eliza Smith, Merrill Cornell Smith, Mary Jane Smith, Morris Smith, Mabel Irene Smith, Mary Smith, Nellie Jane Smith, Oliver Newton Smith, Porter Smith, Russell Smith, Sarah Jane Smith, Stephen Smith, Thomas Warren Smith, William Smith, Warren Rufus Smith, Asenath Snow, Rachel Snyder, Charles Somers, William Franklin Spaulding, Judson Levi Spaulding, Phebe Myrtle Spaulding, Leah Elitha Spaulding, Frank Reed Spaulding, Ada Myra Spaulding, John Sperry, Irving Sperry, Elitha Sperry, Cora N. Sperry, Helen Spicer, Josephine Spitzer, Theodore Sprague, George Herman Sprague, Julia Clark Sprague, Theodore Mason Sprague, Walter Kenneth Sprague, Experience Squires, Rox Squires, Oliver Standard, Elijah Stackweather, Elijah Stanton, Daniel Stanton, Belle Stanton, John Stanton, Freeman Harlow Stanton, Lyman Stanton, Louise Stanton, Susan Stanton, Edwin M. (Hon.) Stanton, Robert Stanton, Julia Steele, Rachel Loretta Steele, Daniel Steele, Bertha Stephan, John D. Stephan, Mary Stephan, Mary Stephenson, Rachel Stephenson, William Stephenson, John Stead, Bessie Angeline Stead, Emma Stead, Anson Stevens, Thomas Stevens, Samuel Stevens, Deborah Stevens, Harriet Stevens, Armavilla Stevens, Betsey Stevens, Elbridge Stevens, Harrison Stevens, Mrs. J.R. Arthur Stevens, Clara Stitt, John N. Stoner, Herbert Keller Stoner, Mrs. Harriet Beecher Stowe, Hosea Stratton, Charles Jonathan Stratton, Chester C. Stratton, Edna A. Stratton, Floyd R. Stratton, Florence M. Stratton, Lela M. Stratton, Harriet Stratton, Jonas Strong, Sarah A. Stout, Joseph Stout, Alpha Sturgill, Anna Stryker, Alice Carrie Stryker, Ansel Garrett Stryker, Addison J. Stryker, Betsey Stryker, Catherine Stryker, Caroline Stryker, "Caty" Stryker, Charles Reed Stryker, Charles Everett Stryker, Chester James Stryker, Emeline Stryker, Everett Austin Stryker, Ella E. Stryker, Emma Stryker, Garrett Stryker, Garrett W. Stryker, Joseph Stryker, James Stryker, Joseph B. Stryker, Lucy Maria Stryker, Martha Stryker, Martin Lewis Stryker, Nancy Stryker, Norman Eaton Stryker, Nelson Stryker, Olive Stryker, Saloma Stryker, Ella Stuart, George M. Sunday, Rev. William A. Sunday, "Billy" Sunday, Michael Sult, Etta Bell Sult, Lucy Della Sult, Francis Sult, Pearl Sult, David Earl Sult, George Robert Sutherland, Mary Freta Sutherland, Mary Irene Sutherland, Orson Reed Sutherland, Ann Sutphen, Elizabeth Sutor, Rosebud H. Sword, Martin V. Sword, Julius Sykes, Chloe R. Sykes, Evaline Sykes, F.M. Symmes, Joseph G. Symmes, Marion Francis Symmes, Jane Taft, Caroline Taft, Lura Taft, William Taylor, Minerva Tanner, Peter Terner, Hiram H. Ten Eyck, George Edward Ten Eyck, Lela Estella Ten Eyck, Pearl Evaline Ten Eyck, Susan Terry, Mary Harriet Thayer, Dr. Charles Henry Thayer, Nathaniel Thayer, Aline Thayer, Sarah Thayer, Jared Thayer, Marion Alden Thayer, Nathaniel Thayer, John Thend, Jacob Thend, Jane Thomas, John A. Thomas, Fern Thomas, Leone Thomson, Nettie Thompson, George Woodbury Thorndike, George William Thorndike, Phebe Tibbitts, Timmerman Family, Margaret Timmerman, Anna Timmerman, Daniel Timmerman, John Timmerman, Christopher Timmerman, "Col." Titcomb, Marisa Lovinia Totten, Henry Totten, Fanny Emeline Town, Robert Newton Towns, Rebecca Tracy, J. Eugene Traber, Jacob Traber, Ralph Traber, Ray Hugo Traber, Albert B. Treat, Charles Leveret Treat, Howard Allen Treat, Edna Beebe Treat, John R. Truckenmiller, John McKenzie Tucker, William Tucker, Capt. William Tupper, Jennett Tuttle, Jeremiah Tuttle, Susan B. Tyler, Barbara Ulrich, William Henry Van Buren, Henry Van Buren, President Martin Van Buren, Rosslyn Henry Van Buren, Tracy Henry Van Buren, Charlotte May Van Buren, Mary L. Van Patten, Arithmetic Van Slyke, Catherine Varior, Nicholas Veeder, Adeline Vincent, Roy Wadhams, Eliza Wagner, Elizabeth Wait, Sarah Ann Waldron, Walker Family, Sarah Walker, Eliza Jane Walker, William Stewart Walker, Nelson Buell Walker, Truman Jeremiah Walker, Truman Addison Walker, Ethel Harriet Walker, John K. Walker, Peter Walker, Daniel Walker, Jane Walker, Ella M. Walcott, Solon E. Walrath, Ellen Barbara Walter, John Lee Walter, Phebe Warner, Hon. Judson Warner, Ely Warner, William Warren, Sarah Warren, Richard Warren, Nathaniel Warren, Samuel Warren, Ellen M. Warren, William B. Warren, William C. Warren, Oscar Washburn, Frank F. Washburn, Gen. George Washington, John C. Weaver, Harriet Weaver, Sally Webster, Hon. Daniel Webster, Buel Wells, Nettie Wells, Charlotte Wells, Jerome Wells, Fannie Wells, Julia Emma Wells, Chester A. 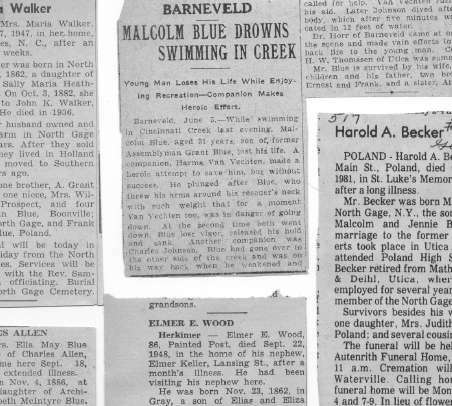 Wells, Martha Wells, James Wells, James Weier, Russell Lee Weier, Fay Francis Weier, Esteal James Weier, Mary Wert, Mary Wheldon, Edwin Max Whelpley, Lucy B. White, John K. White, Capt. J. White, Leonard Obadiah Whitcher, Olive Whittaker, Catherine M. Wildey, Luther Wilmert, Lillie Williams, John T. S. Williams, Frances Fern Willoughby, Florence G. Wilson, Caleb Wilson, Susan Wilson, William Wilt, Amelia Wilt, William Wing, Margaret Winegar, Mary Elizabeth Witherstine, John Witherstine, Henry Witherstine, Melchert Witherstine, David Witherstine, Abram Witherstine, Catherine Witherstine, Margaret Witherstine, Anna Witherstine, Betsey Witherstine, William E. Witherstine, Eliza Ann Wolcott, George Wood, Gerald Wood, Jane Wood, Capt. Isaac Woods, Chester Storrs Woodward, Francis Woodward, Frances Woodward, Wellington George Woodworth, Harry E. Woodworth, Graydon Read Woodworth, Rufus Wright, Nathan Wright, Charles Millard Wright, Elsie Sabrina Wright, Emma Carrie Wright, Nathan Alexander Wright, Mary Ella Wright, Lottie Wright, Benjamin F. Young, & Hannah Zelly.